If you are looking into getting a new mattress, you surely have come across mattresses that are mainly made of latex and others that are made of memory foam (in addition to a more traditional innerspring concept). While some people have a decent idea of the differences between the two, many don’t fully understand which type of mattress would be right for them. In this article, we want to highlight the differences between memory foam and latex mattresses and ultimately try to help you decide which type might be right for you. Let’s start with memory foam mattresses. Memory foam mattresses are known for how they react to your weight and to the pressure that your body imposes on it while sleeping. Every person’s body has different needs when it comes to weight, pressure and maximizing comfort, and this is the beauty of the memory foam mattress: finding the right balance for you. When you sleep on a memory foam mattress, you leave an imprint, shaping the mattress to fit with your body’s specific sleep position. Because the memory foam mattress will shape to fit with your body by spreading out your weight along the bed, sleeping on this sort of mattress can make for a more comfortable sleep. With a memory foam mattress, you avoid sleeping on springs, which tend to lead to discomfort at various pressure points on your body. Even better: once you move about your bed or alter your position, the weight is released and the material of the mattress conforms again to its original, untouched state. Perhaps the largest drawback of buying a memory foam mattress, however, is the components of the mattress material that give it its memory foam capabilities. The mattress is typically made up of polyurethane, a polymer that is associated with harmful chemicals, such as methylene chloride, which can be irritating and sometimes even harmful to your health. Memory foam mattresses also tend to sleep hot, and they can give off a slight chemical odor. Some of the better mattress companies have been able to address these issues head on and make them much less of a concern. Latex mattresses, on the other hand, have their own advantages. With latex mattresses, you get a firmer, more resilient feel than that of memory foam mattresses, as well as a safer, more allergy-friendly sleep, as it is made of more natural materials. These mattresses tend not to sag, which is common complaint for some memory foam mattresses. Latex mattresses also tend to stay cool, regardless of the temperature. This can provide a very comfortable sleeping environment. And yet, latex mattresses are not without their own disadvantages. Latex mattresses tend to be more firm, and so those looking for a softer sleep may not enjoy a latex mattress. 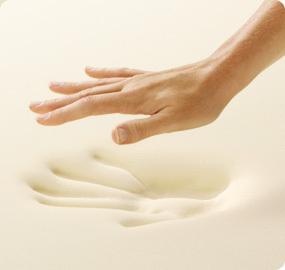 The heaviness of the mattress, too, is an issue, as most latex mattresses tend to be quite heavy and difficult to move. Some people also may not enjoy a springier feel that latex mattresses provide. Now that you know the basics of each sort of mattress, you must consider what sort of sleeper you are, and what sort of sleep you are looking for before choosing which mattress is right for you. If you find that you often wake up from a sleep with a sore body, then you should look into the memory foam mattress, as the softer material will help to alleviate those painful pressure points that ruin your sleep. If you are someone that loves the idea of jumping into bed, sinking in and reveling in the comfort of the contours, then the softness of the memory foam mattress is also right for you. Further, if you are usually a sleeper that is not bothered by body heat at night and not bothered by using products that are not necessarily the most eco-friendly, then you, too, should check out memory foam mattresses. If, however, you are a sleeper that enjoys a firmer, stronger feel to your mattress, and dislikes the sensation of sinking in, then a latex mattress should be right for you. Moreover, if, indeed, you are worried about feeling hot while you sleep—and, therefore, feeling sweaty—then latex is also worth checking out. There are some companies that have sought to provide the best of both worlds and have a mattress with layers of memory and latex. Casper and Essentia come to mind as examples of companies that do provide this type of mattress. If you feel that you want a blend of these two types of mattresses is what you are looking for, then definitely take a look at these companies. They can contour to your body, while also being springy, firm, and cool. These companies are making the debate about latex versus memory foam a little murky by combining them into one mattress. All signs point to these mattresses being really great at capturing the benefits of both while limiting the drawbacks. The debate between these two types of mattresses will rage on, but hopefully we have helped you get a better feel for which type of mattress might be better for you.